There’ve been a few openings in Glasgow since my last visit (for the previous Glasgow Coffee Festival, back in 2015), so when I returned for this year’s festival, I had lots of places to catch up on. Top of the list was Primal Roast, which opened in late 2015, and was the one place everyone said to visit. In the western part of the Glasgow’s compact city centre, it made the perfect kicking-off point for my one-day tour as I stopped by for breakfast. Occupying a spacious basement on the north side of St Vincent Street, there’s a bright, sunny front section, with limited seating, and a large, cosy rear with multiple tables and sofas where you can curl up all day if you like. The family-run Primal Roast is as much about food as it is coffee, with both reaching a similarly high standard. Local roasters, Dear Green Coffee, provide a bespoke house-blend on espresso, while there’s a continually-rotating cast of guests on filter through either V60 or Aeropress. If you’re hungry, there are full breakfast (until 11 on weekdays and all-day Saturday) and lunch menus, with extensive vegan options for both. There’s also a range of interesting cakes. I almost missed Primal Roast, tucked away in its basement on St Vincent Street, one of the many east-west thoroughfares which form part of Glasgow’s central grid of streets. If you know it’s there, you should be fine, but from street level it’s easy enough to walk past if you’re not paying attention. Set back a little from the street behind iron railings, steps on the left lead down into a light-well/small courtyard in front of the windows, conveniently depositing you in front of the slightly-recessed door on the right-hand side. Inside, the layout’s simple and effective. The counter is at the back on the left, with a large, open space between it and the door, leaving plenty of room for anyone waiting to order or to collect their coffee to go. The only seating here is the four-person window bar which is behind you to the left as you enter. The front of the counter is given over to display the cakes and food, while the till is along the right-hand side of the counter, which is where you’ll also find the brew bar, with the espresso machine and menu on the back wall. Off to the right, opposite the till, a small, cosy, seating area opens off the main space. It has no windows, but there’s plenty of borrowed light from the main space, plus numerous spotlights are embedded in the walls/ceiling. There’s a sofa, cunningly tucked away against the back wall next to the chiller cabinet, while three high, round two-person tables with tall chairs provide the remaining seating. One’s in the entrance to the seating area, with a good view of the counter, another’s against the front wall (to your right as you go in) while the third’s against the right-hand wall (directly ahead of you). If that’s all there was, Primal Roast would be a neat, cosy place, but there’s more. At the back, on the right, a small doorway leads to a corridor running towards the back of the building, past the kitchen, which is behind the counter on the left. At the end, the corridor opens out into two large, connected seating area with sofas/armchairs and multiple tables. Immediately to your right is a large sofa, with a cluster of armchairs, while beyond that, again on the right, are two conventional tables. The seating area then does a dog-leg to the left, where there is another sofa, this time with the single armchair on the left. Finally, at the back, are three well-spaced conventional tables. In contrast to the front, it’s very quiet and secluded back here, the ideal spot to get your head down and do some work. Or have a nap. Turning to the coffee, Primal Roast has plans to get a second grinder so it can serve single-origin guest espressos, but for now, it’s just the house-blend, a mix of Brazil/Guatemala from Dear Green. Dear Green was also guesting on filter, while Edinburgh’s Fortitude was due on next. 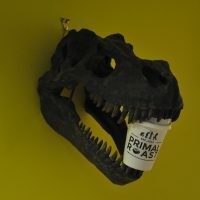 Other roasters to have graced the brew bar at Primal Roast include home-grown Avenue Coffee, Edinburgh’s Machina Espresso, Sheffield’s Foundry Coffee Roasters, Manchester‘s Ancoats Coffee Co, Bristol’s Extract Coffee Roasters and Union Hand-roasted from London. I had a lovely flat white to start my day, the coffee and milk in perfect harmony. I’d also come for breakfast and, while tempted by the eggs, since this was Scotland, I felt obliged to have porridge, which was as lovely and creamy as the flat white. I’m very particular about my porridge and am always pleased when I find somewhere that meets my exacting standards. Liked this? Then take a look at the rest of Glasgow’s speciality coffee scene with the Coffee Spot Guide to Glasgow. This entry was posted in Basements, Breakfast, Cafes, Cake, Glasgow, Laptop Friendly, Lunch and tagged include by Brian Williams. Bookmark the permalink.